Cardiac surgeon salary in the US is around $100,143 – $609,837 per annum and $23.84 – $347.31 per hour. 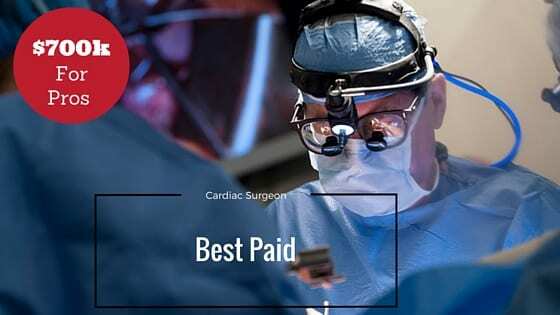 Cardiac Surgeon Salary is one the highest in the cardiology field and medicine as a whole, Based on the AMGA survey, cardiac surgeons earned roughly 26 percent more than cardiologists in general. Cardiac surgeons are physicians whose responsibility involves performing heart surgeries and other complex operations on patients with heart conditions. They are professionals with skills such as paying attention to details, organization skills, communication and timeliness. The cardiac surgeon salary is one of the highest in the surgical field, on average the earn more than other surgical specialties throughout their career. The research by Payscale reveals that the cardiac surgeon salary range is between $100,143 – $609,837 per annum and $23.84 – $347.31 per hour. The salary among the cardiac surgeons also varies this is based on several factors such as location, rural surgeons tend to earn higher than urban surgeons. While the employers and state also influences pay, another is the skills, level of training, and reputation. In another report the salary is said to be flexible and variable supporting other findings. The American Medical Group Association reports a median income of $533,084 from its annual members’ salary survey. A comparable report from the Medical Group Management Association separates cardiovascular surgeons from thoracic surgeons, yielding a higher income of $560,659 for cardiovascular surgeons and $473,927 for thoracic surgeons. Pediatric cardiovascular surgeons earn more, reporting income of $762,846 per year. The work of a cardiac surgeon is a very sensitive one, and the roles are clearly defined. They perform the following duties, task and responsibilities in their day to day activity. Treat complications of ischemic heart disease (for example, coronary artery bypass grafting), correct congenital heart disease, or treat valvular heart disease created by various causes including endocarditis. Communicate with families and patients regarding care plans and make referrals to other specialists as per the standard of care. To be a study, search for schools, residency and know more about the career path, the analysis below will shed more light on the topic. The first step towards becoming a cardiac surgeon in the US is to complete a 4 years bachelor’s degree program in a science related course. Preferably in Physics, Chemistry, Biology and Maths, then apply and sit for the Medical College Admissions Test MCAT exam. This is an entry exam board that admits students for the medical degree program. You will spend about 4 years in a medical school, and another 5 years in a residency program in general surgery or specialization. After the residency program you can start a specialty residency in cardiac surgery for another 2 to 3 years. Upon completion of the various program, you need to pass a board exam to become a fellow. The education in the medical field is a continuous one and may need you to constantly renew your licenses. The selection into this program is very competitive, you must do very well to get into the program. Hence the justification for a high cardiac surgeon salary.